PT Pelabuhan Indonesia III (Persero) - Pelindo III or Indonesia Port Corporation III (widely known as Pelindo 3 Group) is a reputable state-owned port management services company in Indonesia, based in Surabaya East Java. 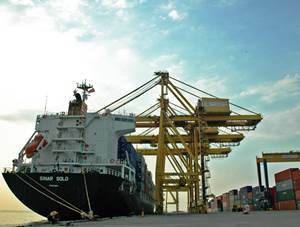 Pelindo 3 Group operates primarily as a port services provider in the central and eastern parts of Indonesia. Its business include Vessel Service, Commodity Service, Container Service, Loading and Unloading Service, Manager on Duty and Passenger Service. As today, Pelindo 3 Group runs its business through 43 port facilities in 7 provinces throughout Indonesia. Pelindo 3 Group also supported by 24 subsidiary/affiliated/associated companies. PT Pelabuhan Indonesia III (Persero) is a non listed state-owned company and its shares are not traded on any stock exchange. PT Pelabuhan Indonesia III (Persero) is 100% owned by the government of Indonesia. According to information found in PT Pelabuhan Indonesia III (Persero) Annual Report 2017 as cited by JobsCDC.com, Pelindo 3 Group generally recorded a good performance in the business year of 2017. Pelindo 3 Group registered total revenue of Rp 8,849 billion in the business year of 2017. This number is up 18.22% as compared with total revenue in 2016 amounted to Rp 7,485 billion. Referring to its annual report, Pelindo 3 Group booked total net income for the year of 2017 amounted to Rp 2,034 billion, an increase of 34.52% from Rp 1,512 billion in the previous year. Total asset in 2017 worth of Rp 25,408 billion as compared with Rp 22,181 billion in 2016. Maximum age of 30 years old on 1 March 2019. Operating knowledge of Ms. Office (Word, Excel, PPT, etc.). Placement in PT Pelabuhan Indonesia III (Persero) - Tanjung Emas Semarang. JobsCDC.com now available on android device. Download now on Google Play here. Please be aware of recruitment fraud. The entire stage of this selection process is free of charge. PT Pelabuhan Indonesia III (Persero) - Operational Administration Pelindo 3 Group March 2019 will never ask for fees or upfront payments for any purposes during the recruitment process such as transportation and accommodation.